It's two guitars in one. Seriously. We know, we know. 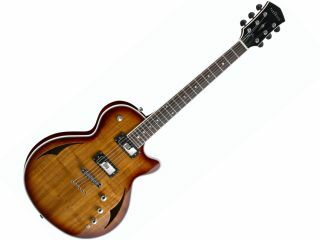 You want an acoustic-electric that plays like an electric but gives you those full-bodied ringing tones of an electric. Guess what? You're in luck. The new Hybrid PWH4 from Parkwood Guitars is that one-of-a-kind instrument, one which delivers on its promises. Here is an acoustic-electric that offers fast, easy playability and yet it sings like a shop full of canaries. The body is constructed of chambered mahogany with a beautiful 4-A flamed Australian blackwood top. The slim, solidbody-feeling neck is mahogany, with a bound rosewood fretboard and a 22-fret scale length of 24 3/4 inches. The pickup configuration consists of a Duncan SM3B Mini-Humbucker in the bridge position, a Duncan SM1N Mini-Humbucker in the neck, and a Fishman Powerbridge piezo pickup -- very cool. The controls are as follows: a master volume and tone for the Duncans, a three-way selector for the Duncans, a concentric volume/tone pot for the Fishman Powerbridge, and a three-way mini-toggle pickup selector for the Duncans and the Fishman. The Parkwood Hyrid PWH4 is a finely crafted, versatile instrument. And here's the best part: it retails for only $999.99 U.S. Did somebody say "deal"?